Ángel Santiesteban Havana 1966. Graduate of Dirección de Cine, resides in Havana, Cuba. In 1989 he won a mention in the Juan Rulfo contest, held by Radio France International, and the story was published in Le Monde Diplomatique, in Letras Cubanas, and in the Mexican magazine El Cuento. In 1995, he won the National Award of the Cuban writers guild (UNEAC); but because of his human (or inhuman) vision of the reality of the war in Angola, where Cubans participated for 15 years, the story was not published. His book, Dreams of a Summer Day, was published in 1998. In 1999 he won the César Galeano prize, given by the Centro Literario Onelio Jorge Cardoso. And in 2001, he won the Alejo Carpentier Prize given by the Cuban Book Institute for his book of linked stories, The Children Nobody Wanted. In 2006, he won the Casa de las Americas prize in the genre of story for the book, Blessed Are Those Who Mourn. 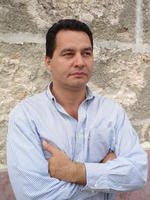 He has published in Mexico, Spain, Puerto Rico, Switzerland, China, England, Dominican Republic, France, USA, Colombia, Portugal, Martinique, Italy, Canada and other countries.